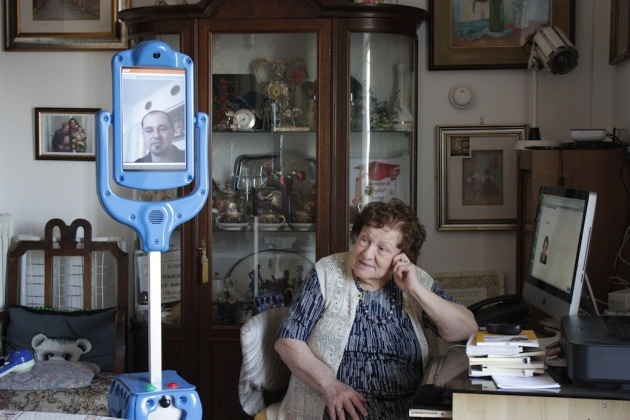 We've already seen assistive robots for seniors, which sit in one place in the user's home. A team at Washington State University, however, has developed one that figures out where its user is, then goes to them and offers its assistance when needed. The university's Robot Activity Support system (RAS) consists of a mobile wheeled robot that operates within a previously-designed "smart" apartment. By wirelessly accessing a network of sensors within that dwelling, the robot is reportedly able to determine where the resident is, what they're doing, and whether they need help. If it finds that its assistance is needed, it makes its way through the home in order to get to the person, utilizing its mapping and navigation camera to avoid obstacles as it goes. Once it reaches them, it uses a tablet interface to offer one of three things – it can show them a video illustrating how to perform the next step in the task at hand, it can show a video of the entire task, or it can lead them to objects necessary to complete the task.